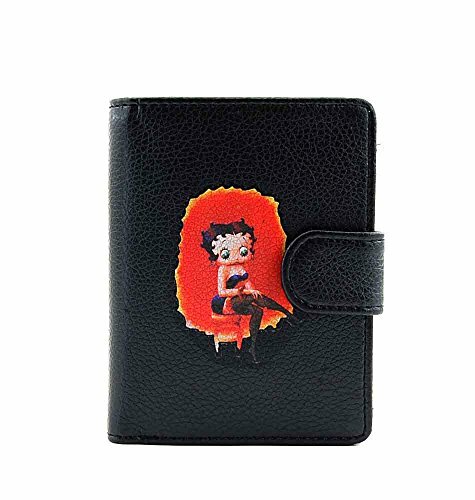 Betty Boop tri-fold wallet is made of fabric with magnet closure. Detachable check book cover, ID window, 6 credit card slots and two compartments. A long zip pocket on the back. The wallet size is 8(L) x 4(H) x 1(W) inches. 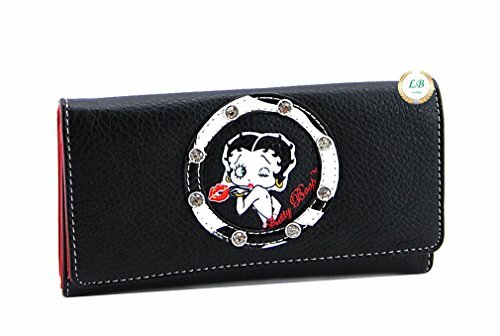 These classy Betty Boop Black, pink and black studs wallet has just the right amount of added style on a basic setting, so it's great for every day but has a little extra flair. Colors add a more interesting effect which is standing out. 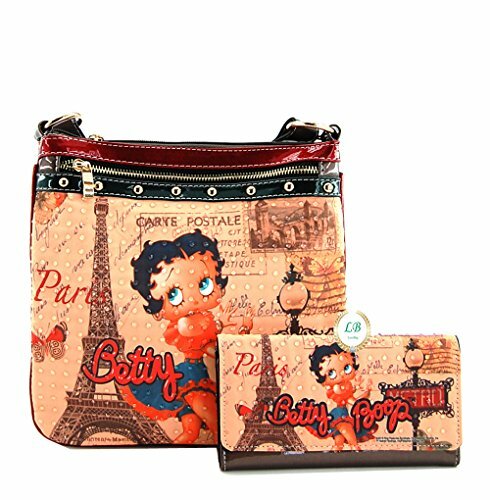 The Betty Boop cross body purse is made from canvas and metallic vinyl, with an inside zip pocket and a cell phone pocket. A zip pocket on the front and a zip pocket on the back. Top zip closure. Officially licensed. The size is 10(L) x 10(H) x 0.5(W) inches (adjustable strap). 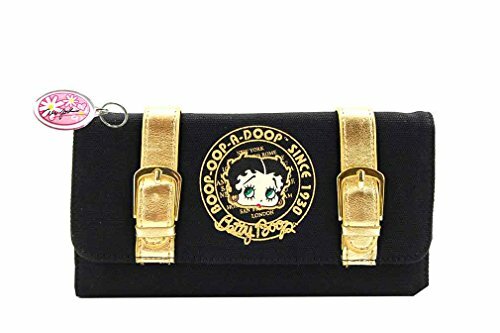 The Betty Boop long wallet is made of canvas and metallic vinyl, with an inside checkbook and an ID window, sixteen credit card slots, two bill pockets and a zip pocket, also a long zip pocket on the backside. Magnetic closure. Officially licensed. The size is 7.5(L) x 4(H) x 1(W). 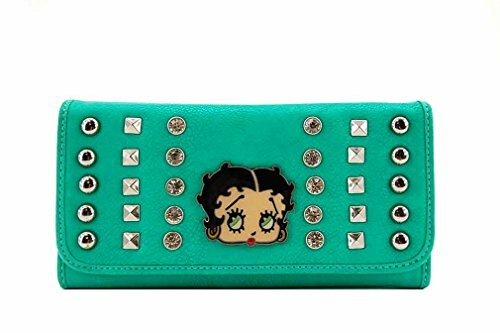 The Betty Boop long wallet is made of faux leather, with an inside checkbook and an ID window, sixteen credit card slots, two bill pockets and a zip pocket, also a long zip pocket on the backside. Magnetic closure. Officially licensed. The size is 7.5" x 4" x 1". 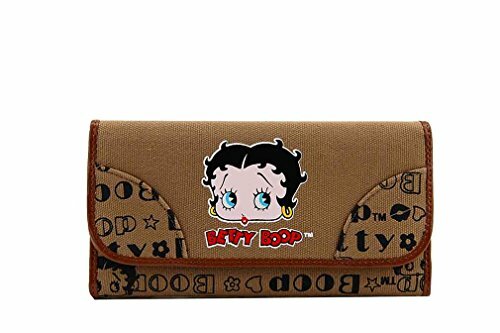 The Betty Boop long wallet is made of faux leather, with an inside checkbook and an ID window, sixteen credit card slots, two bill pockets and a zip pocket, also a long zip pocket on the backside. Magnetic closure. Officially licensed. The size is 7.5(L) x 4(H) x 1(W). 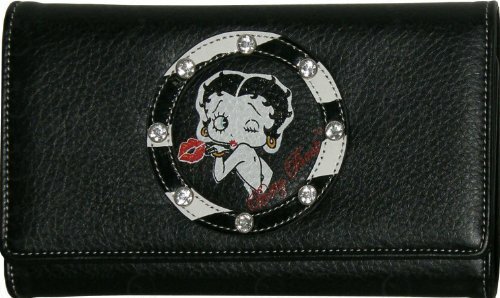 Betty Boop tri-fold wallet is made of faux leather with two button closure. Detachable check book cover, 2 ID window, 8 credit card slots, a zip pocket and two compartments. A long zip pocket on the back. The wallet size is 8(L) x 4(H) x 1(W) inches. 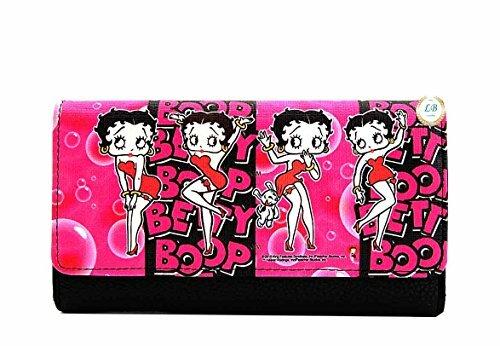 Betty Boop tri-fold wallet is made of fabric with magnet closure. Detachable check book cover, ID window, 9 credit card slots and two compartments. A long zip pocket on the back. The wallet size is 8(L) x 4(H) x 1(W) inches. This fabulous checkbook wallet features a snap closure, interior bill compartment, credit card slots, ID window, and back zip coin pocket. 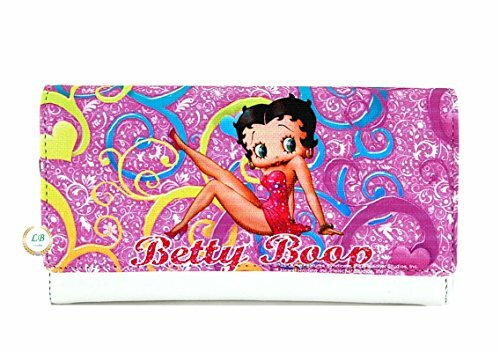 Betty Boop wallet is made of synthetic material. 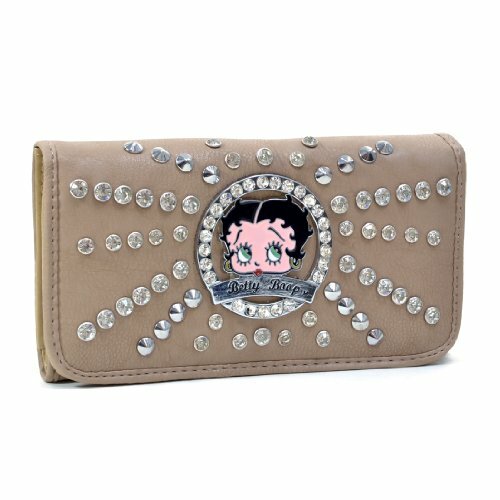 Compare prices on Betty Boop Women Wallet at ShoppinGent.com – use promo codes and coupons for best offers and deals. Start smart buying with ShoppinGent.com right now and choose your golden price on every purchase.